It seems we just can’t resist bacon. 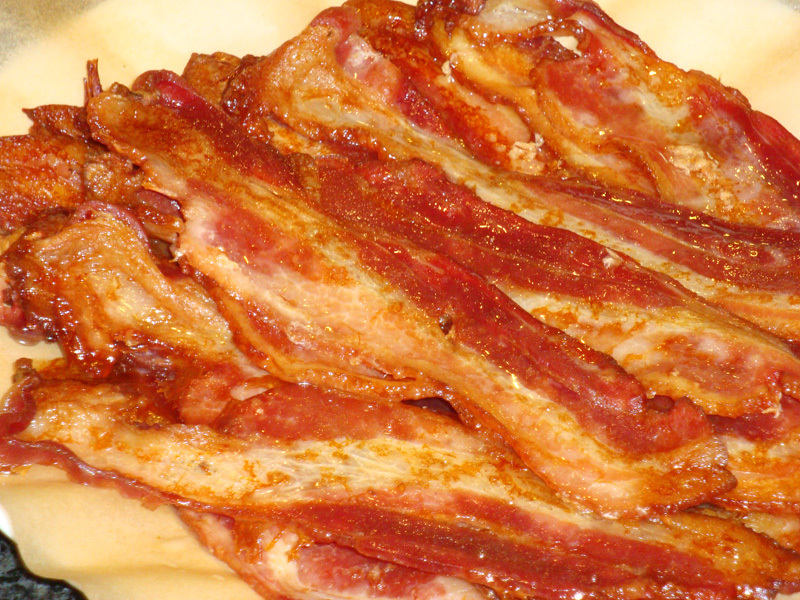 Sales for bacon have held steady in spite of the fact that most people believe it is the most dangerous of all foods. It is a guilty pleasure that borders on addiction and the Kryptonite that has weakened the resolve of many a vegetarian. The basis for our fear of cured meats rests on some misconceptions about the nature of nitrites/nitrates. Did you know that one serving of arugula, two servings of butterhead lettuce, or four servings of celery contain the same amount of nitrites as 468 servings of bacon? Or that the saliva in your mouth contains more than any of them? Our own saliva provides 80 percent of our total exposure to nitrites and vegetables are our main source of nitrites from foods. This is not surprising considering that nitrites occur naturally in plants as a result of the nitrogen cycle where nitrogen is fixed by bacteria. The soil and everything that grows in it is full of nitrogen and the air we breath is 78% nitrogen. So what about those expensive nitrite-free, uncured hot dogs, bacon, and hams being sold as healthful alternatives? They use natural sources like celery, beets, and sea salt for the same chemical and some of them have more of it than conventionally cured meats. A chemical is still the same chemical no matter where it comes from. Like anyone from the South, I have fond memories of the red Folger’s coffee can that sat on the back of every stove for catching the bacon drippin’s. The grease was as valuable as the bacon; it was a good stable fat used for frying and making red eye gravy and for seasoning beans and greens. 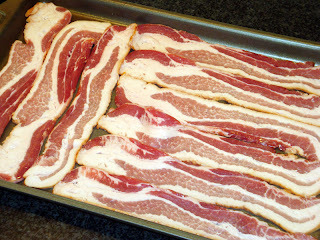 Lay bacon strips flat in pan. Pour water over bacon to almost cover. Place pan in oven and cook for 10 minutes. The water should be boiling at this point. Turn heat down to 350 degrees F and continue to cook for another 10 to 20 minutes or until the water has boiled off and the bacon starts to sizzle. Turn bacon and cook for an additional 10 to 15 minutes or until crisped to your liking. Cooking time will vary according to oven, thickness of bacon, altitude, and other factors, but it should take a total of about 35 to 45 minutes. 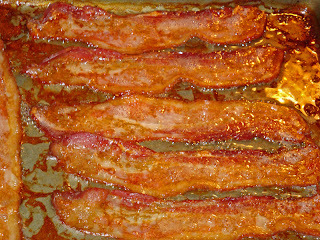 You can take the bacon out of the oven a little early and refrigerate or freeze some for later, if you like. Place it between parchment-lined pieces of foil and crimp the edges tightly. When ready to use, remove the desired number of strips and heat them in a skillet or in the microwave until crisp. *A low-carb version of my mother’s cornbread is in Carb Wars; Sugar is the New Fat. My gluten-free Yogurt Biscuits taste a lot like her buttermilk biscuits. The recipe is here. 1. Scientific Documents Nitrite in vegetables-Scientific Opinion of the Panel on Contaminants in the Food chain, 5 June 2008. Bacon, Cooking Bacon, Nitrite-free, Nitrites. Bookmark. Nice post. I also some time ago exposed the nitrate/nitrite re hot dogs lie on my blog. Glad to see you and others agree. It is very hard to un-scare people. It takes a lot more science to redeem something than it does to vilify it in the first place. Thank you, thank you, thank you for posting this! I read this information several years ago on a junk science blog and it made perfect sense. I've always felt sorry for the folks on the forums who worry incessantly about nitrates and spend ungodly amounts of money on fancy bacon to avoid them. I want to post a huge sticky at the top of the page letting them know they needn't worry. Maybe the word will get around someday. I think Sandy first published some of this info on Junk Science way back in 2008! I don't know why the meat companies don't try to get the word out. It doesn't seem to be hurting sales, so perhaps there's no motivation to change the status quo. In fact, I just saw a report from Technomic, that pork is the fastest-growing protein in foodservice and that on a pound for pound basis, bacon sales grew the most (up 102 million pounds) between 2011 and 2013. Hi scallOway. Yes, it takes a while. That's why I like to do a whole pound and crisp it when I use it. You might try using less water. (If you look at the video they didn't really completely cover the bacon with water.) Or you could use a higher oven temp to speed it up or finish it in the microwave. After my previous comment to comment again. Okay, maybe this recipe is not the best when you are starving, LOL (which I sometimes still get, even on low carb). However they were finally cooked last night after about 90 minutes in the oven, and the really were very yummy. And this morning, when I took the bowl I'd poured the liquid into last night after an hour, I had wonderful pure white fat left after I poured out all the excess water. I will probably try this again. Glad it turned out OK! You shouldn't have to pour off any water. Try using less so the water is all boiled off after the first 10 minutes or so. You can tell because the fat will start to sizzle. Then you can just strain it to use later. Good post Judy. Never knew the science behind nitrates and cooking bacon like that is a new one for me! Thanks, Abbe. Glad you liked it! THAT was the most interesting and informative article I've read in a long time! Thanks for doing the homework! My pleasure, Chef Perry! That's why I'm here. Thanks for the comment! Blueehealer, Yes, I get impatient too. I try to do this ahead so I can put it in the fridge or freezer and then just crisp what I need when I'm ready to use it. Also, as I think someone here suggested, if you use less water, it will cook off faster. This is the best way to prepare bacon for a crowd. I have been cooking bacon in the oven on a cookie sheet for years. I have never thought of adding watter to it. I recycle the grease too. I cook on 350 for 15 minutes in a pre heated oven, 3-4 minutes longer for more crispy bacon. I don't know anyone that can wait 45 minutes for a pound of bacon. I use a broiler pan and all the grease drips into the pan and the bacon on top is crispy as you like it. And it only takes about 15 minutes at 400 degrees. If you don't have a broiler pan, you can use a sheet pan with a rack on top as it does the same thing. My favorite way to cook bacon is on my George Foreman grill, I have an extra long one. It take 2 or 3 cookings, due to the limited space on the grill. The bacon comes out crisp, perfectly flat, and you drain off all the fat, which I save to use when making pancakes or french toast. A teaspoon of bacon fat is all you need for delicious pancakes. Love this post. I have a container of bacon grease at the corner of my stove as I type!!! And I *LOVE* bacon! Interesting way to cook the bacon in the oven. Why cover with water? I've never heard of that before. I generally put thick slices bacon on a broiler pan, pepper it, and then bake it about 15 minutes/side with a hi-broil finish. Love your blog btw – A Big Fat Surprise is a great read! Hi LuckyMama. Thanks for the comment; I'm glad you enjoy my blog and find it useful. The idea for cooking bacon in water came from the smart folks at America's Test Kitchen. They say it cooks more evenly and doesn't shrink as much. I think it probably also reduces the formation of the "bad" chemicals that result from cooking proteins until crisp and brown. I like to think so, anyway!